Though native to temperate regions of Europe, Asia and Africa, peppermint is now widely cultivated worldwide. It is thought to be a naturally occurring hybrid of wild mint varieties. 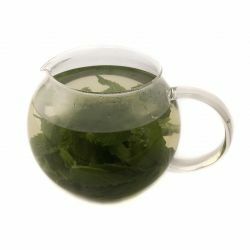 Peppermint leaves are cut during the growing season and used cut or dried for use in concentrated waters, infusions, liquid extracts, powders, and spirits or oil distillation. Peppermint has been used medicinally for thousands of years and some cite it as the oldest herb used in this way. It is mildly anaesthetic, antiseptic and antispasmodic and a popular remedy for IBS and other gastro-intestinal problems. Aromatherapists use peppermint oil to relieve pain and reduce mental fatigue. When applied to the skin and scalp, the cooling sensation of peppermint is probably largely due to its menthol content. This can offer relief from headaches and herbalists also recommend topical application of peppermint to boost circulation. Peppermint flavour can be quite overpowering, so it is often blended with sweet foods like ice cream and chocolate. It is also probably one of the most popular flavours for dental care products and chewing gum. We make our own peppermint infusion by adding boiled water to the dried herb, straining the mixture and allowing it to cool down. We use peppermint infusion in our The Big Tease hair gel to stimulate the scalp to help the hair stand away from the head.